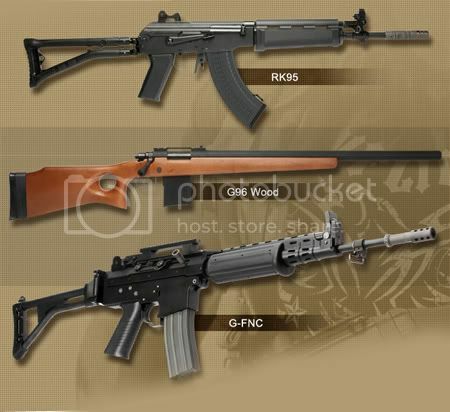 Airsoft Game Sites Philippines is a One Stop Airsoft Ezine and Blog Site Regarding: Airsoft Guns; Airsoft Philippine Teams; Airsoft News and Events; Airsoft Rules; and Airsoft Gun Accessories. ARCADIA, Calif., Sept. 10 /PRNewswire/ -- Today Airsoft is well known, but ten years ago it was a niche sport. This in large part can be attributed to one man: CEO Kent Wu of Airsplat.com. His story is an example of what happens when you combine a passion for a sport with an unyielding and sharp business sense. Airsoft guns are different from air guns, rifles, and pellet guns, in that they use 6mm plastic bb's that weigh far less than metal pellets or sabots, and are safe to use. They're great for police training, military simulation, and play. Ten years ago, Airsoft had a small US presence because they were expensive to produce and ship from Asia. Kent was an avid player of the sport, but was unsatisfied with buying them. Usually ordering something meant paying a hefty shipping fee for freight from Asia, and waiting months to receive the order. On top of that there was always the issue of potentially having the entire shipment confiscated by US Customs. Not that Airsoft guns are illegal, but sometimes over zealous CBP agents would be unclear on the regulations and seize it. Fresh out of college, Kent saw an opportunity. He took his $5,000 in savings, rented a 200 sq foot office space and started AirSplat.com, one of the first ever US based distributors for Airsoft. Working from a one man operation (sales, distribution, and order processing), the company quickly outgrew its initial confines to its current headquarters in Arcadia. Now it's grown into the largest Airsoft retailer this side of the Pacific. Kent and his company essentially paved the way for this sport's popularity in the United States. His company is the only US based retailer to deal directly with manufacturers, getting the best prices which turn into savings for customers. Just looking at the public reports, Airsplat has steadily grown to a staff of 35 and pulled in $14.6 million in revenue last year, according to the INC. 500/5000 listing. Kent is no stranger to awards either, as this is his second year in this lineup, and amongst others he has received (www.airsplat.com/awards.htm). He's regularly on the lookout to expand his company's presence in the marketplace. Airsplat has donated to Airsoft charity events, sponsored Airsoft teams, and has created a new online video review series –Airsplat On Demand - where experts give reviews and technical insight to Airsplat products. Airsplat's unique marketing methods and business practices have created a loyal and lasting customer base. Airsplat Inc. is the leading online-only Airsoft retailer in the United States. It was founded in 2000 and has become a respected and established brand within the Airsoft world. 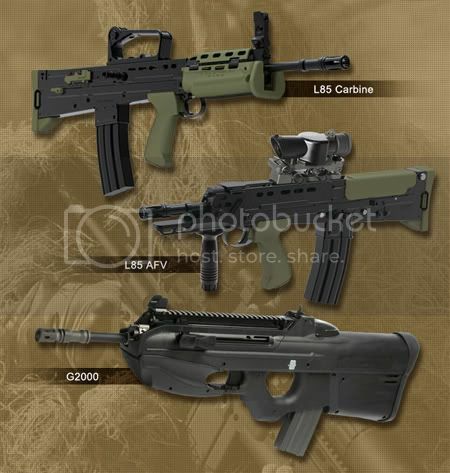 They provide the latest and cutting edge Airsoft and paintball products in the market. Their website Airsplat.com, has in depth information resources, detailed product reviews, and an award-winning customer service department. Airsplat Inc. is based in Arcadia, California. LAS VEGAS, NV and City of Industry, CA – January 19, 2010 – KWA launches a new professional product line and unveils twelve new models at the 2010 Shooting, Hunting, Outdoor Trade Show and Conference (SHOT show) in Las Vegas, Nevada. The LM4 Series is a new lineup of professional training rifles designed specifically for Law Enforcement and Military applications. The new series is powered by KWA’s Force Velocity gas engine and is made to simulate the recoil action of a firearm without the use of live ammunition. Every feature on the LM4 series rifle is realistic and fully functional including the forward assist button. The LM4 rifles utilizes Green Gas as a propellant and fires 6mm airsoft pellets or Identifying Marking (IDM) rounds at a velocity of 500+ FPS with an effective range of 180+ feet. Two models, the LM4 PTR and LM4 SR7, will initiate the launch with additional models as well as civilian versions coming later this year. 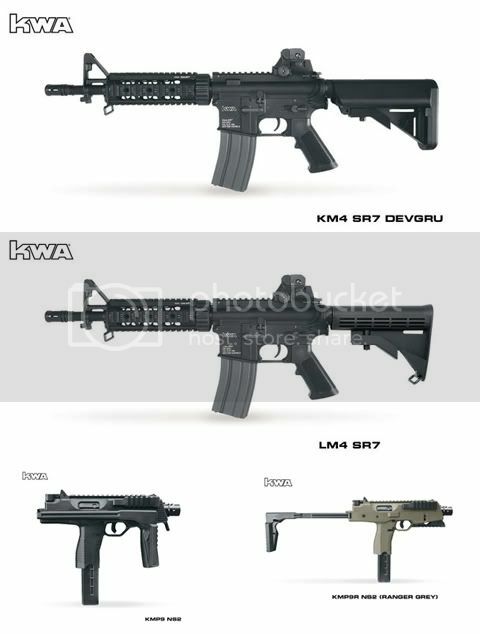 Following last year’s successful launch of the MP7A1, KWA will be introducing two new SMG models, the KMP9 and KMP9R. The new SMGs share the same NS2 gas engine as the MP7A1, offering users unparalleled performance. Both models will be available in three different color variants; Black, Ranger Green, and Dark Earth. 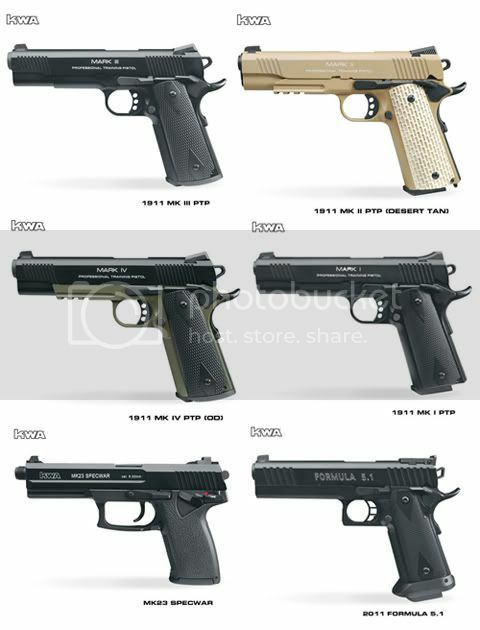 New pistol models include the 2011 Formula 5.0, 2011 Formula 5.1, MK23 SPECWAR and four PTP models: 1911 MKI PTP, 1911 MKII PTP, 1911 MKIII PTP, and 1911 MKIV PTP. A new addition to the KM4 AEG line is the SR7 DEVGRU. Performance specifications and pricing information will be announced at a later date. Airsoft GI Breaking News from SHOT SHOW 2010! Airsoft GI representatives in Las Vegas have just informed the team of some exciting news from Shot Show 2010! Within the next few months Airsoft GI will be the first airsoft retailer to have the Magpul Masada AEG and Magpul FMG-9 airsoft gun (Legit models from Magpul, not A&K)! The exact date of arrival and price is not yet determined but we will be keeping you updated on www.airsoftgitv.com and at www.youtube.com/airsoftgidotcom. 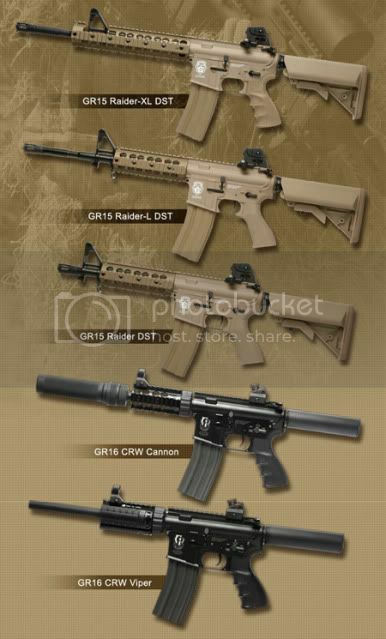 Also just in from Shot, G&G's 2010 line up should be arriving at Airsoft GI by the end of the month. 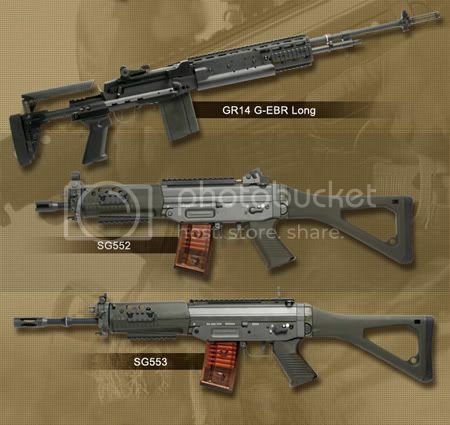 Their new line up includes the guns shown previously and one that isn't shown...The G&G SCAR-H! New guns from Ares and Echo 1 will also be arriving in the following months. Stay tune to Airsoft GI TV and our YouTube channel so you know when these exciting releases will be available for purchase! Wow! I can't wait for that! Thanks Airsoft GI. The chief of the Metro Manila police reminded the public that airsoft guns or gun replicas have been included in the election period’s gun ban. Director Roberto Rosales, chief of the The National Capital Region Police Office, urged airsoft gun owners and enthusiasts, in a statement, to refrain from carrying their guns so as not to violate Commission on Elections Resolution 8714, which included airsoft guns and gun replicas in the list of items covered by the gun ban. He advised them to just leave their guns in places where they practice or play their hobby. He said two men identified as Tristan Castro and Jonas Eslao were nabbed on Sunday morning for carrying a .45 caliber airsoft pistol and a gun replica at the checkpoint in Ortigas Center, Pasig City. Earlier in the day, the NCRPO reported that three policemen, a member of the Philippine Navy and a government official were among the 11 people arrested in the first few hours of the implementation of the total gun ban on Sunday, the National Capital Regional Police Office said. PO1 Aldrin Almanzan, SPO1 William Ronquillo, Navy's S1BM Michael Basahan, who all wore civilian clothes but were carrying their service firearms were arrested at a checkpoint put up in Las Piñas City, NCRPO spokesperson Rommel Miranda said. Another policeman PO1 Dennis Quinto and Lawyer Tecson John Lim, the provincial administrator of Quirino province were also held on Sunday in Quezon City and Manila respectively. “We won't spare our own men in this campaign. So, all those who plan to violate the (gun ban) must think twice,” Miranda said. The NCRPO has set up 70 checkpoints in Metro Manila as the nationwide gun ban took effect ahead of the May 2010 elections. During an inspection, Miranda said Rosales reminded the police personnel manning the checkpoints to be courteous and respect human rights of the motorists and the public. Meanwhile, Rosales also appealed to election candidates to file their application for Temporary Security Detail (TSD) at the Joint Security Control Center soon to allow them to employ security personnel with a legally issued firearm. As of Sunday afternoon, 26 applications had been approved and 131 applications were still pending for approval. PORT ANGELES -- A Port Angeles man unintentionally caused a scare by playing with a fake rifle while with a group of friends near an apartment building Thursday. Five Port Angeles police units blocked the apartments near the intersection of C Street and Lauridsen Boulevard after a 9-1-1 caller reported a man or a group of people brandishing a "rifle of sorts" at the back of the apartments, Deputy Chief of Police Brian Smith said. "Based on the initial information, it appeared to be something that looked like a semiautomatic rifle," Smith said. After surrounding the building, police talked with the men, who were all adults. "It was a very realistic duplication of an SKS rifle," Smith said. The Airsoft replica had a 30-round magazine -- identical to the look-alikes police use for training. The gun was heavy and lifelike with sturdy metal and a wooden stock. "It was an extremely realistic semiautomatic rifle that any reasonable person would think was a functioning weapon," Smith said. Fake guns typically have orange caps that distinguish them from a live weapon. This gun did not have an orange cap. It's not illegal to have a replica gun, but it is illegal to point or brandish one in a threatening manner, Smith said. "It's not a crime if it's not alarming people," he said. Smith said the people playing with the gun "didn't have a lot of situational awareness." "We spent some time talking to them," Smith said.